Although Kelvinch is meant for body text I have endeavoured to make the characters as aesthetically pleasing as possible without compromising its objective to be comfortable to read in long texts. It comes in Regular, Italic, Bold and Bold Italic faces. 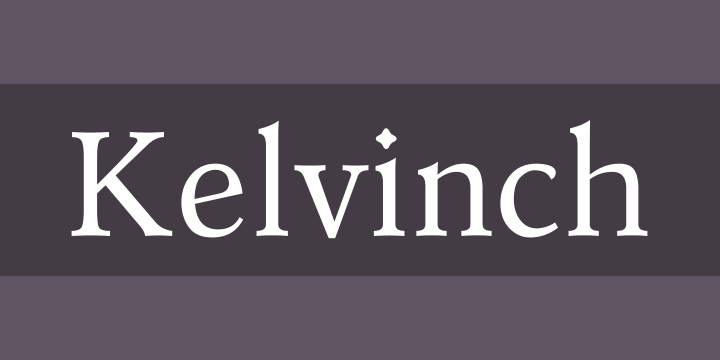 Kelvinch is a free font, free in the sense of free of restrictions and DRM but also free in the sense of cost. Under the terms of the license you may use Kelvinch in any kind of publication, print or electronic, without fees or restrictions. You may modify the font for your own use. You may distribute your modified version in accordance with the terms of the SIL license. You may use Kelvinch for any purpose including commercial usage. The only thing you may NOT do is sell the font on its own as a stand alone font. Kelvinch is licensed under the SIL Open Font License: for the full text, go to scripts.sil.org/OFL. It started out as my own personal font but somewhere along the way that changed and other people became interested in it and I took the decision to try to make it good enough that I wouldn’t be embarrassed to know that other people were using it. I never once considered selling it. It covers many Unicode blocks including Greek & Coptic, Cyrillic, Georgian, Armenian, Mathematical Operators, Miscellaneous Symbols, Dingbats, Runes, Letterlike Symbols, Arrows and a comprehensive coverage of most of the Latin blocks. It has taken over a year to develop. Updated to version 3.1 - There was a fault in the kern tables in 3.0, some of the kern pairs for the Roman font didn’t work. Also changed the position of many diacritic marks to improve the overall appearance of the font. Also changed the format of the download file from .7Z to .ZIP , although this is bigger it is also more compatible with computers which do not have 7zip installed. And I thought this was finished, how wrong I was. Added some more Open Type features and re-kerned the whole thing. Also changed the website address to the address of my blog, the free webhosting I tried wasn’t very good and just seemed like they were trying to force people into getting their paid webhosting by offering very bad service to the free customers and making things very difficult for them. So kelvinch.uk never got up and running, sorry. Hopefully this WILL be the last version.